Char Dham, literally meaning, four pilgrimage sites, are the temples that are among the most highly venerated Hindu Vaishnavite temples in India. These four places of pilgrimage, which were defined by Adi Shankaracharya, include Puri, Rameswaram, Dwarka and Badrinath. Hindus consider it a great fortune to visit the Char Dham during their lifetime. Till the mid-20th century, other pilgrimage sites in the Indian State of Uttarakhand, namely, Yamunotri, Gangotri and Kedarnath, were known as Chota Char Dham. But not, these sites have also been referred to as the Char Dham. The Four Shankaracharya Peeths at the Char Dham school of Hinduism gave rise to at least four Hindu Mathas or monastic establishments. The great saint/seer organized the monks under the four Mathas, headquartered at Jagannatha Puri (in the East), Sringeri Sharada Peetham (in the South), Dwarka (in the West) and Badrikashrama (in the North). Each one of these Peethams was headed by one of the shishyas, who oversaw the entire functioning of his respective Matha. Puri is located in the Eastern side of India, in the state of Odisha. Puri is one of the most ancient cities in the East and is situated along the coast of the Bay of Bengal. Puri is the site of the Govardhana Matha. The main temple is about 1000 years old and was constructed in the 12th century by Raja Anantavarman Chodaganga Deva. His dynasty was also known to have built the Sun Temple of Konark and several major Shiva temples as well. The Puri Jagannatha temple is particularly sacred to the followers of saint Ramananda, who was closely associated with it. It is also of great significance to the followers of Gaudiya Vaishnavism, which was founded by Sri Chaitanya Mahaprabhu. 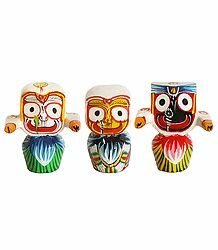 The main deity in the Jagannatha Temple of Puri is Lord Sri Krishna, who is venerated as Lord Jagannatha, or the Lord of the Universe. This is the only temple in India, where Goddess Subhadra, the sister of Krishna, is worshipped along with their other brother, Lord Balabhadra. 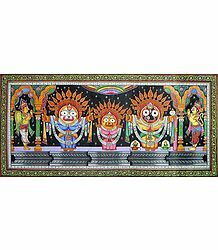 Jagannatha, Balabhadra and Subhadra hence constitute the main trinity of deities at the temple. They are depicted sitting on a bejeweled platform or the Ratnabedi, inside the sanctum sanctorum. Also placed on the Ratnadevi are the three Sudarshana Chakra deities, Madanmohan, Sridevi and Vishwadhatri. The main deities and the Sudarshana Chakra are made from sacred neem logs, known as Daru Brahma. Depending on the season, these deities are adorned with different types of garbs and jewels. Incidentally, the worship of the main deities in this temple pre-date the temple structure itself. It is believed that the rituals may have originated from ancient tribal worship. It is believed that the construction of the Jagannath temple was initiated during the reign of Anantavarman Chodaganga, the ruler of Kalinga (1078 - 1148 CE). The Jaga mohan and the Vimana portions were built during his rule. However, the Oriya ruler Ananga Bhima Deva took over and rebuilt it in its present state in the year 1174 CE. The worship of Jagannatha in the temple continued till 1558, when Odisha came under the siege of the Afghan general, Kalapahad. When Ramachandra Deb established an independent kingdom at Khurda in Orissa, the temple was reconstructed and the deities were reinstalled. The Madala Panji records that the Puri Jagannath temple had been invaded and plundered eighteen times since. Legend has it that, in the Treta Yuga, the original image of Jagannatha mysteriously manifested near a banyan tree, near the seashore, in the form an Indranila Mani or the Blue Jewel. It was radiant and resplendent and had the power to grant instant moksha (liberation) to anyone that so much as looked at it. Lord Yama or the God of Death wanted to hide it in earth. So he came down to earth and hid it successfully. In the next yuga, Dwapara, King Indradyumna of Malwa, heard of the image. He wanted to obtain it. For that, he undertook severe austerities. After some time, Vishnu appeared before him and instructed him to go to the seashore at Puri and find a floating log. He was then asked to make an image from its trunk. The king did as he was told. He travelled to the Puri seashore and found the log of wood. It was radiant and unmistakably divine. He performed a yagna (sacrificial fire ritual), from which Lord Yajna Narsimha appeared. He instructed the king that he should make a fourfold expansion of Vishnu from the log. He specified that the four idols should include Paramatma as Vasudeva, his Vyuha as Samkarsana, Yogamaya as Subhadra and his Vibhava as Sudarshana. The Architect of the Gods, Vishwakarma, offered to build a grand temple to house the deities. 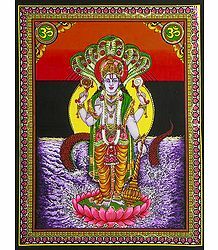 Vishnu then took the form of a carpenter and appeared before the king. He promised to create the idols, on the condition that he should be completely undisturbed till he finished his task. The king agreed to the condition. Vishnu then proceeded to prepare idols of Jagannatha, Balabhadra and Subhadra from the log. Just after two weeks, however, Indradyumna's Queen started becoming restless and anxious. No sound was coming from within the temple and so, she feared that the carpenter had died inside. She requested the king to open the door and check inside. As the king entered the premises, he saw Vishnu diligently at work. However, he immediately stopped working as the king walked in. Enraged that the king had not adhered to his promise of staying away, Vishnu abandoned his work and left, leaving the idols unfinished. To Indradyumna's horror, the idols were missing hands and legs and had only stumps in their place. He was completely distraught and begged the Lord for mercy. However, a divine voice told him to install the idols in the temple. The voice also told him that, in spite of having no limbs, the idols were powerful enough to take care of the whole world. 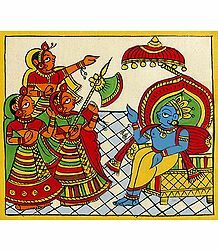 According to the Skanda Purana, Brahma Purana and other Puranas, Lord Jagannath was originally worshipped as Lord Neela Madhaba, by a Savar tribal chief, named Viswavasu. When King Indradyumna heard about this, he sent a Brahmin priest, Vidyapati, to locate the deity. The Brahmin could not locate it, but happened to meet Viswavasu's daughter, Lalita. He then married her. Vidyapati then coaxed his father-in-law to take him to the location of the deity, who finally conceded and took him blind-folded to Neela Madhaba's place of worship. Without his father-in-law's knowledge, Vidyapati cleverly dropped mustard seeds on the ground, along the way. The seeds germinated in a few days and that enabled him to find his way back to the cave. On hearing this, Indradyumna immediately proceeded to Odisha (then Odra desha) to worship the Lord. However, on reaching the cave, he discovered that the deity was missing. It was hidden in the sand. 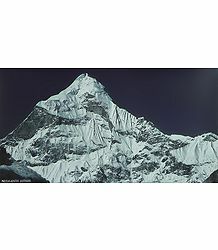 Determined to get a glimpse of the Lord, the king decided to fast unto death on Mount Neela. After a few days, a celestial voice assured the king that he would be able to see his Lord. Later, the king performed a horse sacrifice and built a magnificent temple for his Lord Vishnu. Sage Narada brought him an idol of Sri Nrisimha. This was installed within the temple. At this time, Indradyumna had the dream of collecting the fragrant log of wood and making idols out of it. He built a 1000-cubit high temple for Lord Jagannatha and invited Lord Brahma to consecrate it. Brahma readily agreed and was very pleased to the beautiful temple and the idols installed in it. He told the king to ask for a boon. Indradyumna requested that he should be childless and that he should be the last member of his family. He also added that, if there were anyone alive after him, he should only take the position as owner of the temple and should not work for the society. Brahma granted him the boon and disappeared. Incidentally, the three deities were claimed to be the symbols of Samvak Darshan, Samvak Jnana and Samvak Charita, by Jains, at a later time. These are the Triratha of Jainism - the three deities that grant Moksha to their followers. These deities are also sometimes venerated as Bhairava (an aspect of Lord Shiva) with Vimala (Devi Parvati, the consort of Shiva), installed within the temple complex. So this temple constitutes a sort of fusion of Vaishnavism, Shaivism and Jainism - something we rarely find in India or even the rest of the world. This temple has been visited by several great Acharyas (preceptors), including Madhavacharya, Adi Shankara (who established the Govardhana Matha here), Guru Nanak, Kabir, Tulsidas, Ramanujacharya, Sri Vallabhacharya and others. Sri Chaitanya Mahaprabhu, founder of Gaudiya Vaishnavism, stayed here for 24 years and spread the name of God by chanting the Hare Krishna mantra. The Puri Jagannatha temple is regarded as being the holiest among the Char Dham. Traditionally, a Hindu devotee's visit to the four temples starts from Puri, proceeding in a clockwise direction to the other temples. This is considered to be a pradakshina (circumambulation) of sorts. 1. Vimana or the Garbha griha (sanctum sanctorum), which houses the deities on the Ratnavedi. 2. Mukhashala or the frontal porch. 3. Nata mandir/Natamandapa, which is also known as the Jagamohan. This is the dancing hall for the audience. 4. Bhoga Mandapa, which is the hall for the offerings. The Nila Chakra (Blue Discus) is mounted on the top shikhar or peak of the temple. Every day, a Patita Pavana (flag) is hoisted on this structure. The Nila Chakra is considered as sacred as the main deities. This is the most revered iconic symbol and is the only physical object, whose markings are considered sacred in Jagannatha worship. It is also considered to be a symbol of protection. The Singhadwara or the Lion Gate is one of the four gates to the temple. This gate, which features two crouching lions on either side, forms the main entrance. Baisi Pahacha or a flight of twenty-two steps leads into the temple complex. The idols of Jaya and Vijaya, gatekeepers of Vishnu, are placed outside, on either side of the temple gate. During the Rath Yatra, the main idols are taken out of the temple via this gate. On their return, they first have to take permission from Devi Mahalakshmi (she has to be appeased, as the deities neglected to take her with them). A massive sixteen-sided monolithic pillar, known as the Arun Stambha, stands in front of the main gate. This pillar was first installed at the Konark Sun Temple. Apart from the Singhadwara, there are three other gates, facing north, south and west. They include the Hathidwara (Elephant Gate), the Vyaghradwara (Tiger Gate) and the Ashwadwara (Horse Gate). The temple complex includes various smaller temples and shrines. The Vimala (or Bimala) Temple is one of the most important Shaktipeethas. This is the spot where Sati's feet are believed to have fallen. Until the food offered to Jagannath is offered to Devi Bimala, it is not considered as Mahaprasad. Incidentally, the kitchen of the Jagannatha temple is considered to be the biggest one of its kind in the whole world. It is believed that the work in this kitchen is overseen by Goddess Mahalakshmi herself. There are several other important temples dedicated to the worship of Goddess Mahalakshmi, Uchchhishta Ganapati, Saraswati, Bhuvaneshwari, Narasimha, Rama, Hanuman, Shiva, Surya and many more. The temple complex also features several Mandapas or pillared halls, built on raised platforms. Religious conferences and congregations are held here. The Mukti Mandapa is the hall of the learned Brahmins. The Dola Mandapa features the annual Dol Yatra festival, when the Lord Dologobinda is placed on a beautifully decorated swing. The Snana Bedi is a platform, where the main deities are placed for the ceremonial bathing ritual, during the annual Snana Yatra. There are countless daily and annual rituals and worship services held at the Jagannatha Temple. However, nothing can match the grandeur of the annual Rath Yatra. During the holy month of Asadha (monsoon season in Odisha), the Triad of Deities is brought out into the Bada Danda (main street). The deities, who are usually worshipped within the temple premises, travel a distance of three kilometers to the Sri Gundicha Temple in huge chariots or Rathas. They undertake this journey or Yatra once every year. The Rathas are unbelievably huge wooden structures, which are built anew every year and are pulled by devotees. 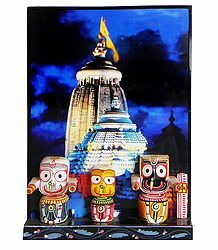 Lord Jagannatha's ratha is about 45 feet high and 35 feet square. It takes about 2 months to construct his chariot. The artisans or Puri decorate and paint the three cars with flower petals and designs on the wheels of the chariots. This elaborate Rath Yatra is also termed as the Sri Gundicha Yatra. 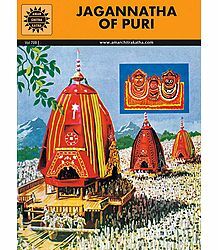 The Chhera Pahara is the most significant ritual associated with the Rath Yatra. The Gajapati King wears the dress of a sweeper and sweeps all around the deities and their chariots. He then cleans the road where the chariots have to pass through. He used a gold-handled broom and sprinkles the entire area with sandalwood water and powder. He does this on two days - the first day when the idols are taken out to the Garden House at the Mausi Maa Temple and on the last day, when the deities are brought back to the Sri Mandir. The deities stay in the Gundicha Temple for nine days. After that, they ride back to the Sri Mandir. On the way back, they halt at the Mausi Maa Temple. The Rath Yatra ritual is very ancient and dates back to the Puranas. The Brahma Purana, the Padma Purana and the Skanda Purana elaborate this ritual in great detail. Similar rituals were held all over India, but the one at Puri is the grandest of them all. The closest airport to Puri is Bhubaneshwar\s Biju Patnaik airport. It is at a distance of about 60 kilometers. There are daily flights to this city from all the major Indian cities, such as Delhi, Mumbai, Kolkata, Vishakhapatnam and Chennai. Besides, you can take long-distance trains or interstate buses from all major Indian cities. Rameswaram is located in the South Indian state of Tamil Nadu. Situated in the Gulf of Mannar, at the extreme tip of the Indian peninsula, it is believed to be the place where Lord Rama built the Rama Setu bridge to reach Sri Lanka. The Ramanathaswamy Temple, which is yet another major pilgrimage center, occupies a very large area of Rameswaram and is dedicated to the worship of Lord Shiva. The temple is said to have been consecrated by Sri Rama. Though this is a Saivite temple, it is considered most sacred by Saivites, Vaishnavites and Smarthas alike. The Ramanathaswamy temple is also one of the twelve Jyotirlinga temples, where Shiva is worshipped in the form of a Jyotirlingam or a pillar of light. This is also one of the 274 Paadal Petra Sthalams, or where the three most revered Nayanars or Tamil Saivite saints (Appar, Sundarar and Tirugnana Sambandar) further glorified the temple with their devotional songs. The Pandya Dynasty helped expand the temple in the 12th century and its main shrines and sanctum were renovated by Jeyaveera Cinkaiariyan and his successor, Gunaveera Cinkaiariyan of the Jaffna kingdom. According to the Ramayana, Rama prayed to Lord Shiva in this very location, to absolve a sin he had committed during his war against Lanka's demon king, Ravana. Rama had to kill a brahmana during this war - this was considered to be one of the greatest ever sins at that time. Rama wanted to have the largest lingam constructed, to worship Shiva. He requested his trusted friend and greatest devotee, Hanuman, to bring the lingam from the Himalayas. Since it would take too much time to bring the lingam from there, Sita, Rama's consort, built a small lingam out of the sand in the Rameswaram seashore. It is believed that this is the very lingam that is housed inside the sanctum sanctorum. Ramanathaswamy, in the form of the Shivalingam, is the main deity of the temple. There are two lingams inside the sanctum - one built by Goddess Sita (which is the primary deity) and the other one, which was brought by Hanuman from Mount Kailas. This second lingam is known as the Vishwalingam. Rama is believed to have instructed that the Vishwalingam be worshipped first, since Hanuman had taken all the trouble to bring it from Kailas. This tradition of worshipping the lingam first, continues to date. Like all temples in South India, this temple too has a madil or a high compound wall surrounding it on all four sides. It measures over 860 furlongs from east to west and over 650 furlongs from north to south. There are huge Gopurams or towers in the east and west directions and finished gate towers in the north and south of the temple. The main tower or Rajagopuram is 53m tall. One of the major attractions of the Ramanathaswamy temple is its strikingly long corridors running across its interior. The main corridor is flanked by colonnades on platforms, which are about five feet high. The second corridor is formed by sandstone pillars, beams and ceiling. The junction of the third corridor and the paved pathway leading from the western Gopuram, leading to the Setumadhava shrine, closely resembles a chessboard. This is referred to as the Chokkatan Mandapam - it is the place where the Utsava deities are decorated and placed during the time of the Vasanthotsavam or the Spring Festival. They are also brought out during the 6th day of the Aadi festival (July-August) and Masi (February-March). These festivals are conducted by the Setupati of Ramnad. The outer set of corridors is known to be the longest in the whole world. It features about 1212 pillars running all the way through its length. In the beginning, the temple was just a thatched shed of sorts. 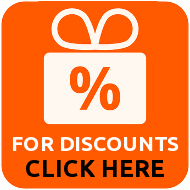 Its present-day structure can be accredited to the work of many prominent individuals, spanning over several centuries. The Setupatis of Ramanathapuram were mainly responsible for renovating and maintaining the temple. Dalavai Setupati built a portion of the eastern Gopuram in the 17th century. The third corridor and the Chokkatan Mandapam were constructed by Muthuramalinga Setupati in the 18th century. Huge effigies of these rulers, as also those of the Mukhya Pradhani (Chief Minister) Muthuirullappa Pillai and Chinna Pradhani (Deputy Chief Minister) Krishna Iyengar, are installed at the western entrance of the third corridor. The temple complex features different shrines for Lord Ramanathaswamy and Goddess Parvatavardhini. These shrines are separated by a corridor. Apart from these, there are exclusive shrines for the worship of Lord Maha Ganapati, Goddess Visalakshi, Perumal and the Utsava Moorthis as well. There are several mandapams too, each serving a different purpose. The temple town includes several tanks (holy water bodies) within itself. 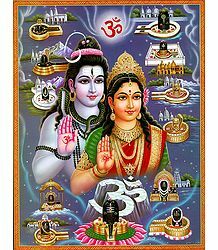 The number totals to sixty-four such Tirthas, in and around the island of Rameswaram. Devotees consider that bathing in these tanks as being equivalent to a penance. Twenty-two of these tirthas are situated within the temple complex itself. These are considered equivalent to the number of arrows in Rama's quiver. Most major among these is the Agni Tirtham, the sea (Bay of Bengal). According to the Shiva Mahapurana, once Brahma and Vishnu had a debate about supremacy in creation. Shiva held a competition to test their strength. He pierced the three worlds as a huge endless pillar of light. This was the jyotirlinga. Vishnu and Brahma travelled downwards and upwards respectively, hoping to find the root and the start of the jyotirlinga. Brahma came back and lied that he had found the end. Vishnu, on the other hand, conceded defeat. 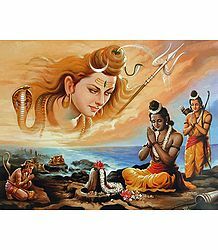 Shiva then appeared as a second pillar of light and cursed Brahma that he would have no place in ceremonies. He also stated that Vishnu would be worshipped till the end of time. The Jyotirlinga shrines, all of which embody the Supreme Shiva, are located at places where the Lord manifested as the fiery column of light. It is believed that there are 64 jyotirlingas, while 12 of them were very powerful. All of them embody the timeless and limitless Shiva in the form of the linga. These 12 shrines include Somnath in Gujarat, Mallikarjuna in Srisailam, Mahakaleshwar in Ujjain, Omkareshwar in Madhya Pradesh, Kedarnath in the Himalayas, Bhimashankar in Maharashtra, Vishwanath in Varanasi, Triambakeshwar in Maharashtra, Vaidyanath in Jharkhand, Nageshwar in Gujarat, Rameshwar in Rameswaram and Grishneshwar in Maharashtra. If you stay in the state of Tamilnadu, you can easily travel to the Rameswaram Temple by bus or by hiring a taxi. You may even travel by long-distance train if you wish. For those wishing to travel by flight, the Madurai airport is the closest one. This is located at a distance of about 167kms from Rameswaram. Dwarka is located in the Indian state of Gujarat. This city gets its name from the word, "dwar", which means "gate" or "door". Interestingly, the city of Dwarka is regarded to be the "Gateway of Moksha". It is situated in the place where the Gomti River joins the Arabian Sea. This was the original dwelling place of Lord Sri Krishna and was believed to be submerged six times by the sea, in the past. The modern-day Dwarka, as we know it today, is supposed to have been built for the seventh time. The Dwarkadhish (or Dwarkadheesh) Temple, also referred to as the Jagat Mandir, is one of the major temples dedicated to the worship of Lord Krishna. He is revered as the Dwarkadhish or the King of Dwarka. The idol of Lord Dwarkadhish is installed inside the main shrine or the Nija Mandir. 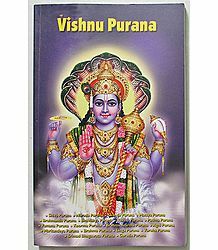 The Lord here is in the form of the four-armed Vishnu, known as Trivikrama. Apart from the main deity, idols of Baldevaji (Balrama) and Pradyumna and Aniruddha (grandsons of Krishna) are installed in the sanctum as well. One can also find shrines dedicated to the worship of Kuseswara Mahadeva (Shiva), Devaki (Mother of Krishna), Veni-Madhava (Vishnu), Satyabhama, Jambavati, Radhika, Lakshmi, Saraswati and Lakshmi-Narayan, within the temple complex. The pujas and other rituals are carried out by Aboti Brahmins. These Brahmins have been conducting the pujas for several centuries. They perform Abhisheks and Aartis at regular intervals, also taking care of decorating the Lord in new clothes, jewels and flowers. There is a popular legend about the idol of Dwarkadhish. Badana, an old devotee, used to travel daily from Dakor to Dwarka, just to have a little glimpse of the Lord. Krishna was so pleased with his devotee's dedication, that one day, he followed her back to Dakor, in the form of an idol. The temple priests thought that Badana had taken the idol away from the temple. They chased her to retrieve it from her. Having received the grace of the Lord, Badana did not want to hand over the idol to the priests. She suggested to the priests that she was willing to hand over the amount of gold equal to the weight of the idol. Much to her amazement, the priests agreed to the deal. When they weighed the idol, they were surprised to see that it was very light - it was exactly the weight of Badana's nose-ring. Krishna was well aware that his devotee had only her nose-ring to offer as gold. So he decided to play out this leela (miracle). Not wanting to disappoint the priests either, Krishna promised via an akashvani (celestial voice) that they could dig in a particular spot the next day, to find a replica of his original image. They were in a hurry to return the statue to the sanctum, where it originally belonged. Deciding not to wait till the next day, they started digging the said location. To their utter dismay, they found only an incomplete statue, which they had to re-install in the Dwarkadhish temple. Legend has it that it is the same idol that we can find in the sanctum today. Dwarka is believed to have been built by Krishna himself, some 5000 years ago. The Mahabharata makes mention of the ancient city as the Dwarka Kingdom. It is believed that the entire kingdom was submerged under the sea when Krishna completed his earthly mission and returned to his abode in heaven. It is believed that the original temple was constructed by Vajranabh, the great grandson of Krishna. He is said to have constructed the temple about the "Hari-Griha" or the house of Krishna. The present temple was built in Chalukya style around the 15th-16th century. This roughly dates around the time of Moghal Emperor Akbar's rule. The imposing five-storied Dwarkadhish temple, which is constructed of limestone, is built with the support of 72 pillars. Rising to a height of 78.3 meters, the spire dominates the entire skyline of the city. An eighty-four foot long pataka or flag, adorned with the sun and the moon, ornaments the dome of the temple. This flag is changed three times a day, but the symbol remains constant. The Jagat Mandir, which makes up the sanctum sanctorum of the Temple, includes a soaring tower and an audience hall. This hall features ancient and modern sculptures. One can enter the temple via two doorways - the main doorway (North entrance), which is known as the "Moksha Dwara" and the southern doorway, which is referred to as the "Swarga Dwara". The outer side of this doorway has 56 steps, which lead to the Gomti River. The temple is open for Darshan from 6.00am to 1.00pm and then from 5.00pm to 9.30pm. Darshans, abhisheks and aartis are held at specified hours of the day. Devotees flock the temple at those times to get a good glimpse of their resplendent Lord. Like the Rameswaram temple, the Dwarkadhish temple is also very close to the sea. You can hire a cab from the city center to reach the temple. The closest airport is in Jamnagar, which is about 150kms away. Further, the Dwarka municipality runs a local bus service to take pilgrims to several other destinations and tourist spots around the city. Badrinath, another pilgrimage site included among the Char Dham, is located in the state of Uttarakhand, in the Garhwal Hills, on the banks of the Alaknanda River. This temple town is nestled between the Nar and Narayan mountain ranges in the valley near the Nilakantha peak. The Badrinath Temple, which is also known as the Badrinarayan Temple, also forms part of the Chota Char Dham. One of the 108 Divya Desams (literally, "Divine Towns") dedicated to the worship of Vishnu, it is open for darshan only six months of the year, between the end of April and start of November. The extreme weather conditions in that region make it inaccessible for the other six months of the year. The presiding deity of this temple is Vishnu, in the form of Badrinarayan or Badrinath. The image of the Lord worshipped in the temple is 1m tall and is made of black stone statue. This temple is considered to be one of the eight swayam vyakta or swayambhu kshetras (one that manifested by itself) of Sri Maha Vishnu. One of the most prominent festivals conducted in this temple is the Mata Murti Ka Mela, which celebrates the descent of Mother Ganga onto Mother Earth. Although Badrinath is a temple in North India, the head priest or Rawal is traditionally a Keralite Namboodiri Brahmin. The Badrinath Temple has three main structures, namely, the Garbhagriha (sanctum sanctorum), the Darshan Mandap (Hall of Worship) and the Sabha Mandap (Convention Hall). The conical-shaped roof of the garbhagriha is about 15m tall, covered by a small cupola at the helm. It is covered by a gold gilt roof. The entire façade is built of stone and has arched windows. A stairway leads up to the main entrance, which is a tall, arched gateway. Once inside, one has to pass through a mandap, which is a large, pillared hall. This leads to the sanctum. The walls of these mandap are filled with intricate carvings. The tall effigy of Badrinarayan is housed in a gold canopy under a Badri Tree. Lord Badrinath holds a Shankha (Conch) and Chakra (Discus). His two other arms are rested on his lap , in a Yogamudra position. Inside the garbhagriha are idols of Kubera, Narada, Uddhava, Nar and Narayan. The temple includes idols of 15 other deities, including Lakshmi (the Consort of Vishnu and the Goddess of Wealth), Garuda (Vishnu's vahana or vehicle), Navadurga (the Nine Manifestations of Devi Durga) and Lakshmi Narasimha. There are shrines for saints as well, including Adi Shankara, Vedanta Desika and Ramanujacharya. Incidentally, all these idols are made out of black stone as well. The Tapt Kund, a group of hot sulphur springs, is located just below the temple. This Kund is considered to be medicinal. Many pilgrims bathe in the springs and only then proceed to visit the temple. 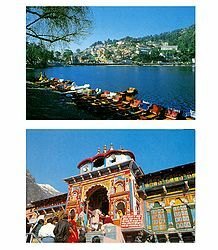 The two water ponds in the temple are called Narad Kund and Surya Kund. - There is no concrete historical evidence regarding the emergence of this temple. However, the Vedic scriptures talk about the presiding deity as Badrinath. This indicates that the temple was in existence as early as the Vedic period (c. 1750-500 BC). - Some experts suggest that it was a Buddhist shrine till the 8th century and that Adi Shankara converted it to a Hindu temple. Incidentally, the architecture of the temple resembles Buddhist viharas or Buddhist temples. - Yet other sources indicate that Badrinarayan was originally established by Adi Shankara in the 9th century. He resided in Badrinath for six months and then in Kedarnath for the rest of the year. It is believed that he discovered the image of Badrinath at the Alaknanda River and enshrined it in a cave near the Tapt Kund. - Another interesting tale relates that Shankara expelled the Buddhists in that area, with the help of king Kanak Pal, the then ruler of Parmar. The lineage of rulers after him helped sustain the temple and they all held the title, "Bolanda Badrinath" or "Speaking Badrinath". Each king's throne was named after Badrinath. Devotees had to first visit the ruler and pay their obeisance to him, before proceeding to visit the temple. In fact, this practice continued until the late 19th century. - During the 16th century, the ruler of Garhwal moved the idol to its present location. Since then, the temple has undergone several major renovations, in order to repair the damage caused by the weather and numerous earthquakes and avalanches in that area. The sacred temple of Badrinath attracts Hindu devotees from all over the world, hailing from all walks of life. All the major Mathas, including Kashi Math, Jeeyar Math, Udipi Pejavar and Sri Raghavendra Swamy Mathas have their branches and guest houses in this temple town. According to legend, Vishnu sat in deep meditation in his own place, in order to keep away from Thuling, a place in the Himalayas. This place was being corrupted by meat-eating monks and adharmic people. So deep was he in meditation that he did not even notice the harsh weather. His consort, Lakshmi, protected him in the form of a Badri (Indian date) tree. Pleased by her devotion, Vishnu named the place Badrika Ashram. Vishnu, in the form of Badrinath, is shown sitting under Badri tree. According to the Vishnu Purana, Dharam had two sons, namely, Nar and Narayan. These sons wanted to choose a place each in the expansive valleys of the Himalayas. Searching for their ideal place to set up a hermitage, they discovered the other four Badris of the Pancha Badri (five related shrines), namely, Bridha Badri, Yog Bhadri, Dhyan Badri and Bhavish Badri. They then found the hot and cold spring behind the Alaknanda River and named it Badri Vishal. - One of the most ancient temples of India, the Badrinarayan Temple finds mention in the Vishnu Purana, Bhagavata Purana, Skanda Purana, Mahabharata, Divya Prabandhas and other literary works as well. - According to the Bhagavata Purana, the Supreme Godhead, Vishnu, lives in Badrikashrama. He takes incarnation as the sages Nar and Narayan and undergoes penance for the welfare of all living creatures. - The Skanda Purana states that Badrinath is the most sacred shrine not only on Earth, but even in heaven and hell. - The Mahabharata relates that this temple can give immediate moksha to the devotees even if they just arrive near it. As mentioned earlier, the most prominent festival held at the Badrinarayan temple is the Mata Murti Ka Mela. The mother of Badrinath is believed to have divided the river Ganga into twelve channels, so as to sustain and nourish living beings on Earth. The place where the river flowed became the sacred land of Badrinath. The Badri Kedar festival is held in the month of June in this temple as well as in the temple of Kedarnath. The festival, which goes on for a period of eight days, features performances by top artists from all over the country. Apart from these, routine pujas are conducted every single day at the temple. The morning rituals include the mahabhishek, abhishek, gitapath and bhagawat puja. In the evening, the purohits perform aarti and sing the geet govinda, or hymns and songs in praise of the Lord. After the day's rituals are over, all the decorations are taken off the idol and the Lord is bathed in sandalwood paste. This paste is then distributed as prasad to devotees the next day. Apart form these, sugar balls and dry leaves are also distributed to the devotees as prasad. From May 2006, the practice of offering Panchamrita prasad to devotees was started. This practice continues to date. The temple closes for winter on the auspicious day of Vijayadashami or Dusshera. On this day, an Akhanda Jyoti (lamp) is lit. It is filled with an amount of ghee that will last for six whole months. Special pujas are performed by the purohit, before the closure. The idol of Badrinath is transferred to the Narasimha temple at Jyotirmath, which is located about 60km away from this temple. The Badrinarayan temple is then opened only around April, on the auspicious Vasant Panchami day. Pilgrims flock the temple on this day, to witness the burning of the Akhanda Jyoti. Devotees come to the Badrinath temple, not only to purify themselves, but also to pray for the salvation of their ancestors' souls. They offer oblations to their deceased loved ones by conducting a variety of pujas, paaths (reading of holy scriptures) and bhajans (singing in praise of the Lord). You can take long-distance trains to reach this temple. The nearest railway station is Dehradun Junction. For those wishing to travel by road, there are several bus services which will take you to the punyasthal. The closest airport to the city is the Jolly Grant Airport in Dehradun. It is located just over 300kms away from the city. The closest International airport is at New Delhi.